Google has rolled out a new web experiment for Chrome. 100,000 Stars: Google’s latest Chrome experiment taps NASA to visually explore the Milky Way. This one is a visualization of the locations of over 100,000 nearby stars (pulls data from astrometric databases and catalogs). 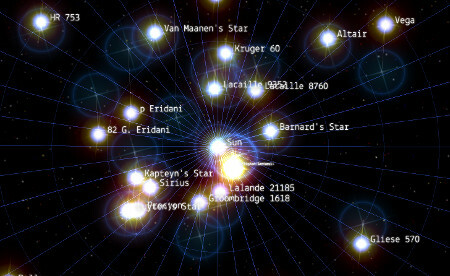 Using Chrome’s WebGL, CSS3D, and Web Audio support, you can zoom in and out to explore the layout of the stars, set against a dreamy soundtrack. You can zoom and pan around the cluster, zoom all the way in to the solar system, or zoom all the way out to see rest of the Milky Way. This web app works best in Chrome, but I was able to try it in Firefox as well. If you are still stuck with IE only, you are out of luck with this demo. Google is perhaps best known for three main products: its search engine, the company’s increasingly popular web browser Chrome, and its omnipresent flagship mobile operating system Android. A galaxy mapping service, however, maybe not so much, but that could change following the completion of the company’s latest project, 100,000 Stars.